Welcome. My name is Rebecca and I am a body-centered psychotherapist specializing in supporting individuals living with chronic illness and pain. I can help you to become empowered in your healing journey with mind-body practices such as mindfulness, relaxation, and healing imagery. Learn to listen to your body, develop self-love, and let go of emotions, thoughts, and inherited patterns that may be contributing to physical symptoms. Chronic illness can be an opportunity to take time out of life, to evaluate what really matters to you and to re-imagine a new way of being. Are racing thoughts or overwhelming emotions taking control of your life? Are you wanting to move on from the past, but you don't know how? Are you seeking therapy that offers lasting transformation and goes beyond just talking about your problems? Are you experiencing physical pain or symptoms that you feel might be connected to stress, emotions, or trauma? If you are coping with chronic illness or pain, therapy for chronic illness can offer a safe and supportive space to navigate the path of your healing journey. 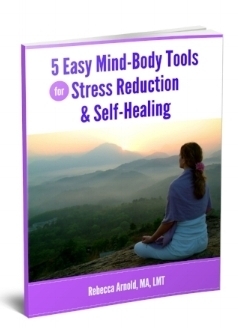 Please begin by signing up to receive a free booklet: 5 Easy Mind-Body Tools for Stress Reduction and Self-Healing. Then take your time learning about my body therapy offerings. Please let me know if you have any further questions, or if you are ready to schedule a session or a free 30 minute consultation. Sign up to receive "5 Easy Mind-Body Tools for Stress Reduction and Self Healing"
What is the Medicine in Chronic Illness? Your Body is Talking... Are You Listening?